There is one thing on this planet that can heal just about any health issue in your life. This system is your immune system. When it’s working in perfect harmony you will be healthy. The problem is that this wonderful system is susceptible to stress. Stress can slow down and often cause our immune system to run at a low level. Even the US Federal Government confirms that ‘90% of all illness and disease is related to stress’. Too much stress for too long creates chronic stress. It puts the immune system in a state of fight or flight, a state where all growth, repair and healing is stopped. Chronic stress not only causes disease, it affects us emotionally and impairs our enjoyment of life. When we are under stress our cells literally close up. They go into survival mode. The cells slow their elimination of waste products and toxins. They don’t receive enough oxygen, nutrition and minerals. Everything stops except what is necessary to survive. This is how chronic stress leads to genetic disease and illness. Research from Stanford University revealed that cells that are open and in growth are literally impervious to disease and illness. We have a sympathetic nervous system is to protect and save our lives when we perceive danger. The problem is today many of us are in an almost continual state of fight or flight. Illness is caused by insufficient energy at a cellular level. During fight or flight, as the cells shut down to conserve energy, oxygen and vital nutrients fail to get in. The Mitochondria – the cells power plants – are being starved. A cell has to have oxygen and it has to be able to get rid of waste from the cell. Our bodies protect themselves from traumatic memories by suppressing them which requires a huge amount of energy and creates a great deal of stress which tires out cells and is responsible for chronic pain and health problems. It stands to reason that if we are going to eliminate physical and non-physical issues at source we have to find a way to heal stress. The truth is the heart knows what we need yet so few of us stay there for long enough. We try and use our logic to think things through and we get ourselves into all kinds of trouble. The Healing Codes bring us back to our hearts where real intelligence lies. When we stay in our hearts and focus on the stress that is causing us pain and feel the stress of that pain – mental or physical – we are right in touch with the core stress that needs healing. The very core that has caused all the symptoms we have been experiencing. Research by The HeartMath Institute in the USA has found that the heart is vital for emotional stability. It is part of the heart, mind and emotional trinity. The heart has an intelligence that is far greater than the brain. It “generates 60 times the electrical output of the brain and connects us, through the heart chakra vortex, to far higher levels of awareness.” (Jack and Anne Stewart). It is constantly communicating to us the wisdom we need, yet our logic kicks in and we become weighed down with thoughts. We use our logic to get through and we find ourselves coping, and sadly cope is all some of us really do in our lives. The Healing Codes change destructive energy frequencies to healthier ones. Dr. Ben Johnson, co-author of The Healing Codes explains that once he was on a flight in the USA. He began noticing all the noises that surrounded him and felt stress. When he put noise cancelling head phones on the noise went away and the stress stopped. The Healing Codes are like the noise cancelling headphones but for issues of the heart. The hypothalamus sends signals to other parts of the body. When we feel stress, even if the stress is not an emergency, we are still thrown into fight or flight mode. These frequencies can be destructive instead of life saving. The way to change a destructive frequency is to hit it with one that is directly opposite. The body’s own healthy energy frequencies overcome the destructive energy frequencies. A bit like turning on a light in the dark, light will always overcome darkness. We heal by getting rid of stress but we can’t feel stress without pictures – memories of what brings up the stress in the first place. So, we heal by changing the energy of the destructive pictures in our hearts. The substance of the memory is an energy pattern, but the actual memory is an image. For years science believed that memories were stored in our brain. The latest research backed up by scientific papers published by Harvard Medical School, Southwestern University Medical School, as well as many other prominent institutions in the USA offer the case for cellular memory. There are numerous cases to be found on the internet where someone receiving the organ of another person begins to behave like that person. Until the age of six our memories go unfiltered into the subconscious. Most of these memories we have forgotten but we formed a belief system from them. They still dictate how we live our lives today. Along with the cellular memory of our parents, we took on at birth, that’s a lot of potential for stress that we carry around with us. The Healing Codes work by removing the stress, freeing our immune system and clearing destructive cellular memory. The stress is what we have to work on to release deep, destructive memories we have forgotten about but our cells have not. 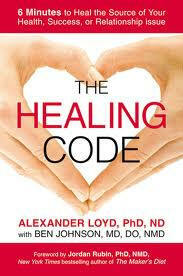 In 2001, Dr. Alex Loyd, a doctor of Pyschology had an intuitive insight, which he later named The Healing Codes. A Christian, with experience in alternative medicine, he prayed for help for his wife’s depression. He instinctively knew the new knowledge he experience would work for his wife and when he got home he showed her The Healing Codes. In the book The Healing Code he writes that in 45 minutes his wife’s clinical depression was virtually gone. It took another three weeks for it to totally disappear. After more than a decade of trying numerous self help techniques and alternative therapies and reading a library of books on depression Tracey, his wife was symptom free. Co-author of the book The Healing Code, Dr. Ben Johnson had been working solely with cancer patients when he was told he had the symptoms of Lou Gehrig’s disease, by two different doctors. He discovered that 80% of people diagnosed with the disease die within the first five years. Though sceptical at first, Dr. Johnson decided to take the plunge and go to a Healing Codes seminar. He felt immediately different. Three months later, after practicing The Healing Codes each day his doctor declared him symptom free. There is officially no known cure for Lou Gehrig’s disease. With a degree in Pyschology and five years of financial struggle behind him, a year after graduating Dr. Loyd had built a thriving private practice, with a six month waiting list. Yet, he decided to put his faith in the fact that The Healing Codes is an effective healing method. 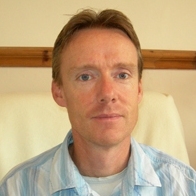 He devoted the next eighteen months to testing stress levels in patients whilst receiving The Healing Codes and gathering a large number of testimonials in the process. The results were amazing and provided proof that The Healing Codes worked at reducing stress in the body. How do we measure stress in the body? The standard test for measuring stress is called Heart Rate Variability (HRV). It measures psychological stress and reflects the rate of stress in the body. It is simple in design and charts the increase and decrease of the heart rate in relation to breathing patterns. According to Dr Roger Callaghan creator of Thought Field Therapy (TFT), HRV rules out the placebo effect. Dr. Loyd’s results showed that ‘The Healing Codes remove enough stress from an out of balance autonomic nervous system to allow it to come back into balance in 20 minutes or less (77% of clients). Most people were still ‘in balance’ when retested 24 hours later. When using The Healing Codes we focus on the stress of the issue not the issue itself. For example, if you suffer from depression you may feel trapped, sad and lonely. We can then ask the question where you feel this and you may say ‘in my chest’. So the depression stress is in your chest. Ask yourself if you remember a time when you felt similar stress before. If so go with that memory if not go with the stress you originally felt. Similarly with physical pain, where do you feel the stress of the knee pain? ‘In my heart’. Because stress is the main cause of unresolved mental issues or pain in the body when we deal with the stress the symptoms associated with the stress also fade away. The next thing to do is to measure the stress on a scale between 0 and 10, 10 being the most stress you may feel. As you work on an issue you can then gauge the intensity of the stress as it begins to change. We pray to remind us that we don’t do the healing, the universe does. We pray to ask for help to heal the stress that we are working on. 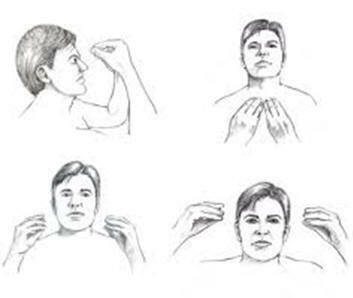 All positions are with fingers 2 inches away from the skin. This creates an energy field allowing the body to produce the precise energy pattern needed for healing. Hold for 30 seconds each. As you hold the points do 2 rounds of sending your love from your heart to someone or something you love. Imagine a circle where the love goes from you to the person then from them to you. Do one round of focussing on receiving love from them. We need to find the opposite frequency of the stress we feel in order to cancel that stress. It has been found that giving and receiving love works best. Imagine someone or something you can offer your love to. Then receive love back from them. This is a very powerful process.